Galway is a pretty interesting place, with plenty of character and cool places to hang out. 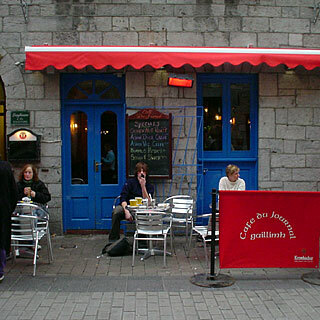 This page documents a few cafes I found in December 2004. Ard Bia is a well-hidden gem: the street-level entrance only reveals the staircase, but once upstairs a large café opens up, full of natural light, proper bistro furniture in dark wood and a choice of sizes, and plenty of nice corners. Best of all is the large sofa and coffee table (with books) that adds Galway to the S-list. The off-white walls are accented by arty photos and greenery in vases. The blonde floor planks keep the place light and make it all seem rather more stylish than the usual. 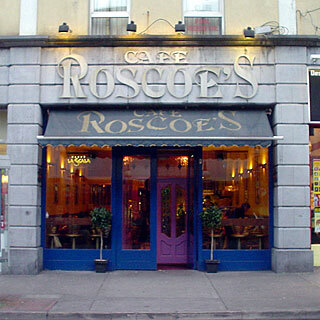 The menu features trad-sandwiches, cosmopolitan hot specials and various cakes. The soup in particular looks like a good bet. 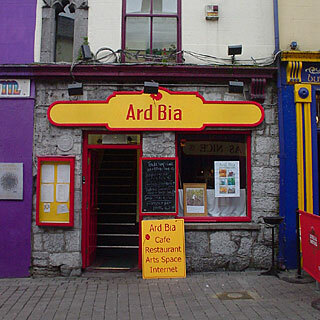 I gather that Ard Bia has moved from its Quay Street location since I last visited, so I hope the new location is just as good. 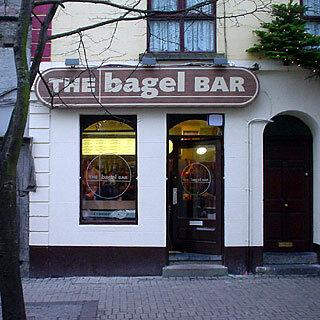 The Bagel Bar is Galway's bagel chain outpost, in the usual modern North-American style. The various shades of veneer and beige walls come out fairly stylish and the service is polite and efficient. However, if you are visiting town you can probably do much better for lunch, but you are here for a while I can imagine that you might get bored of the delicious soup or chowder with tasty brown soda bread that you can get elsewhere. The Bagel Bar certainly caters to that, with a menu full of adventurous world-bagels. I normally hate going to the kind of places we have back home, when I am somewhere small and interesting like Galway. However, I was pretty sure I would find some kind of ethnic bagel filling. Indeed, my hot fried-breakfast bagel was good, although the bagel itself was suspiciously light and fluffy, which is not what I am used to. Meanwhile, at the other end of the table I am sharing, The Manhattan and The Specialist are getting all sorts of positive comments - 'heartily recommended', in fact. The smart yuppie cafe-restaurant with soft lighting, two-tone wood, two-tone brown seating and posh bar stools make this quite the smart venue. Or would do if the music were well-picked jaz instead of the horrors of commercial radio. What is wrong with these people? The 'day menu' starts with breakfast and goes via salads to proper main courses, so this might be a reasonable place for a big lunch. 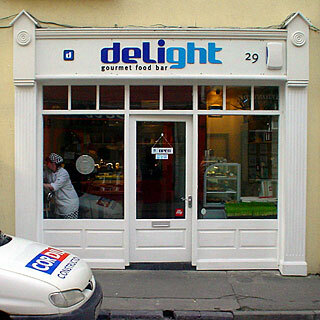 This place was my best find when I first visited Galway - an excellent relaxed café whose arty atmosphere makes for a pleasant place to sit around and chat or read, or just stare blankly into space while you try to work out what to order from the extensive menu. 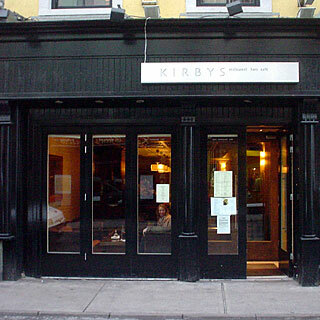 The ambiance inside, and usually the weather outside, suggest the likes of porridge, soup or a hot breakfast. There are all sorts of other dishes, though, including salads and veggie options. The interior's relatively bright lighting is softened by the beige and browns of the walls, furniture and decorative bookcases. The café's sense of character also benefits from plenty of paintings and events posters by the door. On top of all this, the classical music fits quite well. This is still my favourite café in town, and it is not just me - on this visit it is already getting busy at 10.30 in the morning. Most reassuringly, there are even several people reading a paper. This entry in the lots-of-tables-canteen category has more interesting decor than most, with lots of gold and purple, and lighting that suggests an atmosphere. However, this is badly wrecked by loud commercial radio and traffic noise that follows a cold draught through the open door. The menu offers a wide and fairly standard selection of hot and cold food, breakfast, sandwiches, cake, and even bagels, which is a plus. I won't be hanging around around for long enough to try them, though. Although I normally avoid the many small sandwich bars that cater to the lunchtime working crowd, with tubs of fillings and a few uncomfortable token seats, I was drawn in here by the promise of gourmet food. Once inside I figured that I might as well sit down on a bar stool at the wall-shelf for a coffee as well. The interior is actually quite pleasant, with a tastefully decorated bright white look, and a lively trance music backing. The coffee is good, although weak by continental standards - more to local tastes I expect. Best of all, though: my 'gourmet' herb and garlic sausage roll is indeed delightful.